The Department of Infrastructure and Isle of Man Constabulary have today, Wednesday 14 May, launched a joint road safety campaign for the 2014 Isle of Man TT. The campaign calls on bikers to be aware of the consequences of dangerous and careless riding, and to take care on the Island’s roads throughout the two-week long TT festival. The central message this year is:- ‘For All Our Sakes, Slow Down’. The message is underlined by two striking images. One shows a crashed motorcycle in a bin with the message ‘Don’t Bin It’, a play on the phrase used by bikers to describe a crash. 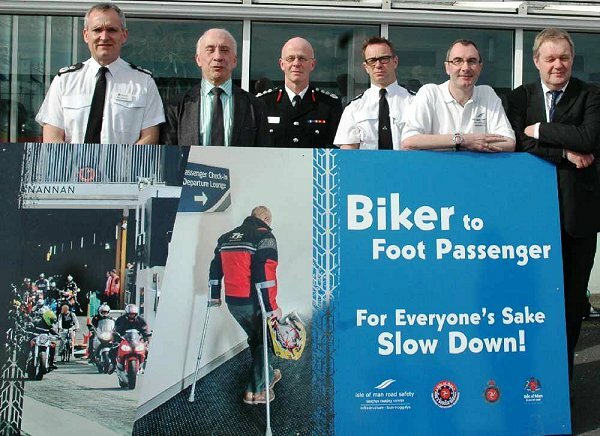 The second shows the popular image of motorcycles arriving in the Island on the Isle of Man Steam Packet Company vessel Manannan alongside a photo of an injured biker heading home on foot, and on crutches. The message is ‘Biker to Foot Passenger’. Campaign banners and billboards are being placed at the busiest UK and Ireland ports that visiting fans will pass through on their way to the Isle of Man, as well as around the TT course and at campsites. There will also be posters in prominent places all over the Island, and members of the Department’s Road Safety Team will be out and about talking to visitors and locals about the campaign and handing out specially-designed information leaflets carrying important road safety messages. The team will be stressing the importance of keeping speeds down, keeping your distance from other vehicles and respecting the central white lines as normal road rules apply. There will also be radio and press adverts, including in the motorcycle press, in the build-up to and during the TT. The campaign is intended to reach all road users. For example the Department has also produced a special information leaflet for Island children, warning them to be aware of the dangers on the roads. Members of the Road Safety Team will be asking people to complete questionnaires about the all-encompassing 2014 campaign. The feedback received will be used to help develop and improve future road safety messages. ‘During the TT festival many people in the Island are going about their normal everyday business, and it is important our visitors understand and respect that, and that residents are aware of the increased traffic volume and the fact visitors may not be familiar with our roads.